Travel with Kevin and Ruth! : Our first hike in Lesotho! By the way, Lesotho is pronounced "Ley-soo-too". Just so you know. Some of you had asked how we are managing to get on the internet here in the middle of the Lesotho mountains. There is a very weak cell signal coming from an old 2G EDGE connection. We are connected, but it's slower than dial-up! Still better than nothing at all. We had to buy a new SIM card for the local cell service. Cost was R20 ($2.10) and another R100 ($10.50) for 200MB of data use. It'll do us for our time here, and although it's slow, it works! Oh, and somebody asked about bugs. haven't seen any mosquitoes yet, and we sit out in the evening without being bothered by anything. There are quite a few house flies around during the daylight hours. They buzz around you, but of course they don't bite. Okay, so on Monday the 10th, we did our first hike. Not to sure of the distance, but it was three hours including a stop at a waterfall pool where you could go swimming. Here at Malealea Lodge they have a strong interest in keeping the community employed as much as possible, so they strongly suggest that you hire a guide for any hiking. The trails are unmarked, so it's in your own best interests anyhow, plus it's reasonably priced at R10 ($1.05) per person per hour. 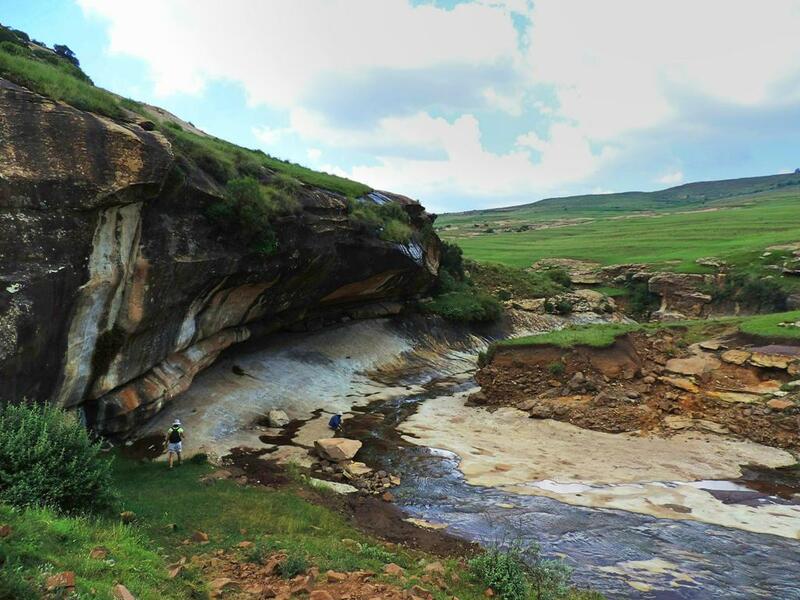 We called for a guide, and Tseliso showed up to take us to the gorge where the natural swimming pools are. Tseliso is 35 years old. He has a wife and two children. His English is not bad, even though he only went to school through the 5th grade. He is a farmer, but he only farms for his family for food. His only job is guiding these hikes which he does only two or three times per week. He is trying to save money to buy a sheep, but it will cost around R500 ($52.50) and right now all of his money goes towards sending his children to school. He pays approximately R3000 ($315) per year for each child, and books and uniforms are on top of that. Leading us down into the gorge. Yes, it is the woman's job to collect and carry firewood back to the home. I'm only guessing, but I would bet each one of those bundles weighs more than 50 lbs! Not only do they cook with this wood, but they store it for the winter (June, July, August) when it does get around the freezing point occasionally. Near the gorge. Can you see Ruth hiking below that huge rock? And Tseliso washing his hands in the river? When we got to the swimming hole, there was a couple of girls already there with their guide. One was from South Africa, and the other from Holland. Ruth got in the water! Gotta admit that it looked inviting, but she said it would have been too cold for my liking. Our guide, Tseliso. He has never been outside of Lesotho. Ruth, climbing back out of the gorge. It was pretty steep in places! Saw this big fellow along the way. Back at the lodge, we relaxed for the afternoon and met some of the other guests. The place is quite big and can sleep over 100 people in various forms of accommodations. It was quite busy on the weekend when we arrived, but right now it has slowed down quite a bit. Every day at 5:30pm the Malealea choir and band do a performance for the guests. One lady in the village is their choir director, and she went around recruiting people who wanted to sing. Considering there are only about 400 people who live in the area, the talent she got together is quite amazing! The band is even more interesting. Every instrument they play is entirely made from scraps they found lying around the village. Goes to show that if you have the ambition to make music, you will find a way. We took a couple of videos for you, but our internet isn't good enough to upload them. Rest assured, you will get to see them eventually. Next post? A four hour horseback excursion into the mountains! Interesting hike and can't wait to hear the band! Both the band and the choir were amazing! Lots of info about the area on the Malealea Lodge website at the top of your blog - enjoyed the You Tube videos - what happy people there enjoying life!!! Malealea Lodge offers lots of things to do in the area and if you are doing a hike or a pony trek your guide will be from the village and they give information on the area and about the local culture. We loved it here! Nothing like living a simple happy life like these people do. Their life my may seem simple but it's not easy, although they are happy people! Amazing band. Love how clever they are with their home made instruments. Music lovers will always find a way to make beautiful sounds. You are right, that if you love music enough you will find a way to make it and these guys do a fabulous job of it! Thanks for the proper pronunciation. I was doing it SO WRONG. Gorgeous pictures of this really stunningly beautiful area including that amazing ram shot, or I think it's a ram. How long will it take your guide to save up for his sheep? Yes, that is a ram and isn't he a beauty?! I don't know how long it will take him to save up for it. It will depend on how much money he spends on other things first, like food, school for his children and of course his cell phone air time and on how many times he guides and for how long and how much his tips are.